Milford, 2 @ Foxboro, 3 – Final – Foxboro pushed one run across in the first tinning and tacked on two more to close the regular season with a win over Milford. Colin Thoener struck out eight batters in a complete game effort, scattering seven hits and issuing three walks. Senior Mike Saliba gave Foxboro the lead with an RBI single in the first inning while Cam Feldman knocked in the Warriors’ first run in the third inning. Aaron Wentling (2-for-3) doubled in the third and scored on a hit from Rob Theriault (2-for-3) in the third inning. Milford’s Nate Irwin allowed just one earned run in a complete game effort, striking out four. Alex Coady had two hits and Alex Macek added an RBI double for Milford. Franklin, 7 @ Natick, 2 – Final – Franklin junior Jason Ulrickson allowed just one earned run and senior Jake Lyons knocked in three runs as the Panthers recorded their first win of the day. Ulrickson scattered eight hits, walked two and struck out seven to earn the win. Lyons went 2-for-3, including a triple and also scored a run, Jake Macchi had a double, a run and two RBI and Cam Lupien scored twice and knocked in one run for Franklin. Franklin, 8 vs. Hopkinton, 0 – Final – The Panthers picked up their second win of the day, shutting out Hopkinton in the Pedroli Classic championship game. Jake Noviello earned the win with five shutout innings, striking out nine and allowing just three hits and one walk. Bryan Woelfel closed the game with two scoreless innings, striking out three with just two hits allowed. Offensively, Ryan Hodgkins (two RBI), Tyler Gomes (run), Jack Macchi (two RBI, run) and Cam Lupien (two runs) each had two hits for the Panthers. Milford, 8 @ Sharon, 0 – Final – Milford junior Aidan Wilde made an impact on both the mound and at the plate as the Scarlet Hawks registered a win in their first game of the day. Wilde tossed a one-hitter and walked just one batter while striking out eight in a complete game effort on the mound. At the plate, the junior had two hits, including a triple, scored two runs, knocked in two runs and walked once. Senior Anthony Arcudi added three hits, one run and an RBI, senior Tony Mobilia had two hits, including a double, and scored a run and senior Luke Allgrezza went 3-for-3 with a double and an RBI. North Attleboro, 6 vs. Bishop Feehan, 5 – Final – Bishop Feehan scored a pair of runs in the first inning but the Rocketeers rallied for six straight runs and held off the Shamrocks for the win. Senior Ryan Prince earned the win on the mound for North Attleboro. Offensively, senior Tyler LaFreniere had three hits and two RBI, John Brennan went 2-for-3 and Nick Crawley knocked in a pair of runs on a pair of hits. Stoughton, 4 @ Whitman-Hanson, 2 – Final (10 inn.) – Stoughton loaded the bases in the top of the 10th inning and pushed across two runs to split the season series with Whitman-Hanson. With the game tied 2-2, Ruben Gonzalez (two hits) led off with a single, Ryan Sullivan (two hits) followed with a double and Jack Connelly (two hits) was intentionally walked. After a pair of fielder’s choices, Pat Hagerty drew a walk to push across one run and Luke Johnson scored on a wild pitch to make it 4-2. Johnson earned the win, tossing five scoreless innings in relief. Johnson allowed just two hits and walked one while striking out three. Franklin, 3 vs. Abington, 10 – Final – Franklin’s Alexx Niss belted a two-run home run in the top of the first inning but the Green Wave plated three runs in the bottom half and never surrendered the lead the rest of the way. North Attleboro, 1 vs. Bishop Feehan, 2 – Final – North Attleboro tied the game at 1-1 in the sixth inning but Feehan plated the winning run in the bottom of the seventh to pick up the win. Olivia Capobianco and Meg Barlow each singled and Liz Morehouse brought the tying run in with a a sacrifice fly. North freshman Bella Erti scattered seven hits while striking out four, including her 100th of the season. Morehouse and Ashley Cangiano each had a triple in the game while Abby Gallagher recorded a double in the exclusion game. Taunton, 0 vs. Dighton-Rehoboth, 2 – Final – Dighton-Rehoboth scored a pair on unearned runs in the top of the seventh inning to edge out Taunton. THS head coach Dave Lewry said Courtney Fisher pitched a great game, allowing just three hits and striking out eight. Jaime Brown, Katie Van Zandt and McKenzie McAloon each notched two hits for the Tigers. Foxboro, 3 @ North Attleboro, 2 – Final – Foxboro swept singles matches with sophomore Julia Muise prevailing in three sets to clinch the win for the Warriors. Junior Sophia Prinos won 6-0, 6-1 at first singles, senior Lexi Nelson won 6-3, 6-0 at second singles and Muise recorded a 6-2, 4-6, 6-2 win at third singles. North Attleboro’s Katie Demontigny and Azka Siddiq won 6-1, 6-2 at first doubles and the team of Hana Hershey and Shurobhi Nandi won 6-2, 2-6, 7-6 (7-5) at second doubles. Coming off a great run in the state tournament a year ago, the Attleboro Bombardiers will be looking for a repeat performance in 2017. This year, instead of relying on just one or two pitchers, Attleboro will trust the depth of its pitching staff to get things done on the mound. Senior Tyler McGovern will be the anchor of the staff while classmates Matt Callahan, Dylan Maskell and Tyler Davis will also factor in on the mound. Juniors James Weir, Drew Pagano, Erik McCormick and John Candiales, along with sophomore Eoin Hammel-Kelleher could all see innings on the mound as well. Callahan will also see time in the field at shortstop while Weir looks to be a reliable option at first base. Matt Marguerite will patrol the outfield while Steve Hamerski, Tyler Davis, Drew Pagano, Sam Larkin and Alex Whittingham are all likely candidates for spots in the outfield as well. Head coach Matt Bosh said there is a lot of internal battles for most positions. “Every year brings new challenges and elements,” said head coach Matt Bosh. “The biggest difference from last year I think is the depth of the pitching staff. While last year we were top heavy with Nate and Tyler, this year I think we have more guys that can compete and spread the wealth in eating up innings. But we’ll see how that plays out. The Hock will be tough, like always”. First year head coach Greg Digirolamo likes what he sees from his Bulldogs so far, but the challenge has been finding some grass to play on. Heading into the first week of the season, the weather has prevented the Bulldogs from getting to play outside yet. Nonetheless, there are some experienced varsity players that will likely factor in right away for Canton. Junior outfielder Matt Casamento might be the most experienced player of the returnees but seniors Jackson Maffeo, Danny Hartnett, Kevin Monagle, Tommy Kilduff and Matt Crandall are all likely to factor in during the season. A trio of juniors will be Digirolamo’s go-to for pitching to start out the season. Ryan White, Austin Maffie and Rob Wilkenson are all likely to see a lot of innings as the season gets underway. Foxboro will be looking to get back to the postseason again this year and will rely on its starting pitching and experience to get there. Hockomock League All Star Aaron Wentling is back on the mound while Colin Thoener – who missed nearly all of last season – is healthy and ready to produce on the mound. Steve McLaughlin, who has some varsity experience, will also get starts on the mound for the Warriors. There aren’t many players more experienced at the varsity level than catcher Jesse Galanti, who enters his fourth year as a starter and third as captain for Foxboro. Outfielders AJ Bubencik and Cam Feldman have also played a lot of games at the varsity level and will be counted on to lead the way for the Warriors along with infielder Chad Bearce. Between Franklin’s pitching staff and its lineup, there is a lot of experienced players with success at the varsity level ready to go this season. After relying on a trio of sophomores on the mound last year, all three are back ready for strong junior campaigns. Jake Noviello and Jason Ulrickson logged a lot of innings are starting pitchers while Bryan Woelfel emerged as one of the best bullpen options in the league. Now they are poised to be one of the top starting rotations in the league. Offensively, Franklin brings back outfielders Ryan Hodgkins (.388) and Jake Lyons (.368) along with first baseman Josh Macchi (16 RBI) and catcher Tyler Gomes (16 RBI). While there are spots to fill left by talented seniors that graduated, having those four back is a very good sign for the Panthers. It’s going to be a challenge for King Philip to replace three all-star caliber pitchers in one season, but head coach Pat Weir and his Warriors are ready to try. Jake Cavanagh, Jack DiCenso and Jon Rolfe are all pitching at the collegiate now after helping guide the Warriors to a Kelley-Rex title a season ago. This season, Stephen Murray and Chris Wing are back as two of the more experienced arms available for Weir. Will Weir, known for his bat and defensive play at shortstop, could also emerge as an option on the mound. Will Weir is also one of the key bats back for King Philip, along with senior centerfielder Ryan Coulter. Both had impressive seasons as juniors and will be relied to lead the way in 2017 for KP. “I’m hopeful we can improve on yesterday and compete today, all we ask is all you got,” said head coach Pat Weir. After just missing out on the postseason a year ago, there is a lot of optimism for the 2017 Hornets squad. With two top pitchers and a solid lineup returning, there’s plenty of reasons to be optimistic. One main reason is the return of senior pitcher Nolan Dousa, who missed last year after undergoing Tommy John surgery. After a standout sophomore campaign, Dousa had to watch last season from the dugout. With Dousa on the self, sophomore Tyler Dalton emerged as the team’s ace, giving the Hornets a great 1-2 combination for 2017. Offensively, the Hornets bring back shortstop Max Boen – one of the team’s top hitters a season ago – along with senior outfielder Zach Peterson, who led the team in runs last year, and senior infielder Aidan Cahill. Milford will be looking to get off to a better start in 2017 after a slow one a year ago played a big part in the Scarlet Hawks missing out on the postseason. The good news for head coach Paul Pellegrini is that he has the majority of his impactful players back this season. Senior Alex Macek really impressed after missing the beginning part of the season with injury and could be one of the top pitchers in the league this season. Tylor Renaud also provided quality innings a year ago. Aidan Wilde has been one of the top players in this league for two years yet he’s only a junior this season. Not only is he very good defensively, he’s one of the toughest at-bats in the league and will certainly be a spark plug for the Hawks. Expect senior Anthony Arcudi and sophomore Alex Coady to be contributions this season as well. The Rocketeers will boast a young squad, but not one that lacks in talent. After graduating 13 seniors last year, Big Red will rely heavily on the players they do have returning this season. The strength of the squad will be up the middle of the field, starting senior captain Kyle McCarthy in centerfield, senior captain John Brennan patrolling shortstop and junior Zach DeMattio – and his big bat – manning the catcher position. From there, each spot is open for competition according to head coach Paul Tobin. Matt Iaconis and Peter Cohen are competing for time at third while Nick Crawley, Aidan Harding, Billy Drummond, Jackson Billingkoff and Nick Sinacola are all batting for infield spots. Nick Sinacola, Nathan Pearce, Aidan Harding and Matt Iaconis are all candidates to form Big Red’s starting rotation while Peter Cohen, Ryan Prince and Ryan Pasquel are likely to see time out of the bullpen. “We are talented but inexperienced, so there will be some learning and growing to go through,” said head coach Paul Tobin. Oliver Ames has a lot of players back from a year ago and first year head coach Joe Abarr believes that should translate into a potent lineup for the Tigers. 2016 HockomockSports.com Underclassman of the Year Matt Muir will be captaining the team as a junior and will make the transition from second base to shortstop. He will likely fill the leadoff role for Oliver Ames and will also see time on the mound. Senior Sam Burr is also a team captain, will be the team’s number one starter and also man first base for the Tigers. Sophomore third baseman Chris Pearsons is back after making some noise during his freshman year and senior Kyle Gagliardi will bring a lot of experience while he patrols center field for the Tigers. Michael Mulrean will see a lot of time on the mound again this year and sophomore catcher Jake Erlich will look to give the Tigers a boost after transferring from Xaverian this year. The Eagles had a lot of young pieces a year ago and will be looking to take the next step in 2017. Leading the way will be two three-year varsity players in captains Jake Marglous and Aiden Arnold. Marglous will be back behind the plate for another season while Arnold, one of the top power hitters in the league, will be back at first and also be an option to come in to pitch in relief situations. Other returning Eagles with varsity experience include Jake Teven, Danny Emerman, Jason Hertz, Ben Schwartz, Drew Naisuler, Ben Stamm, Brad Zongetti and Spencer Singer. Max Tarlin had a very strong season as a sophomore a year ago and will be at the top of the rotation as a junior this season. Sophomore Noah Kamens also picked up some valuable varsity time a year ago and will be a top option for Sharon this season. “Our strength will be in the experience we have in our pitching staff,” said head coach Kee Arguimbau. “We’re looking forward to the season behind the leadership of our captains, Jake Marglous and Aiden Arnold. There aren’t many teams in the area that have the luxury of returning their top three pitchers, but the Black Knights of Stoughton do. 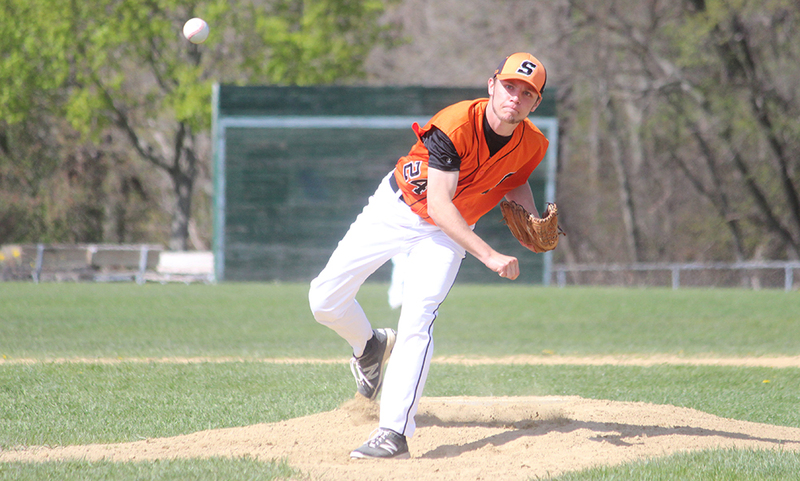 Justin Hutchinson, Ryan Sullivan and Nico Parmeggiani are all back after stellar junior seasons on the mound, putting Stoughton is a good position to start the season. Luke Johnson will also see time on the mound, adding another experienced arm for the Black Knights. Jack Connelly is back at first base after a breakout junior season, Ruben Gonzalez will shift over to take over at shortstop while Matt Hadley and Michael Batte will both see time in the infield as well. Both Hutchinson and Sullivan will see time in the outfield when they aren’t pitching while Pat Hagerty and Nick Hardy are back as well. Johnson and sophomore Evan Gibb will battle for the starting catcher spot. “We have a lot of experience returning, with 10 seniors on the roster, and look forward to competing in the always tough Hockomock League,” said head coach Mike Armour. While there is a new coach in the dugout for the Tigers, there will be a lot of the same faces on the field for Taunton in 2017. Blair Bourque takes over the reigns for the Tigers, who also lost league MVP Luke Figueira to graduation. However, Matt Machado and Joe Manchester are back in the outfield, Jacob Crawford is back in the middle infield, Jimmy Hoye is back and ready to take over as starting catcher, and Danny Keogh and Jack Moynihan return as two experienced pitchers. With the battle for the number one pitcher open, Keogh and Moynihan will be the main two options to begin the season. “Both of these guys saw success last year pitching at the varsity level and we are looking to continue and build on that success,” Bourque said. Machado, one of the top defensive players in the league, had a breakout junior season at the plate and will look to be one of the top offensive producers again this season. Manchester shined in his sophomore season and will give the Tigers some power in the middle of the lineup. Crawford is easily one of the best defensive infielders in the league and Hoye will look to prove he’s one of the top catchers.